When a player attempting to catch a fly ball is temporarily blinded by the glare of the sun in his eyes, he may "lose the flyball in the sun." As you remember, I went to Hilton Head two weekends ago! It was a really last minute trip Tracy and I booked. There was a snow storm coming into the city and we saw it as a great opportunity to get out. 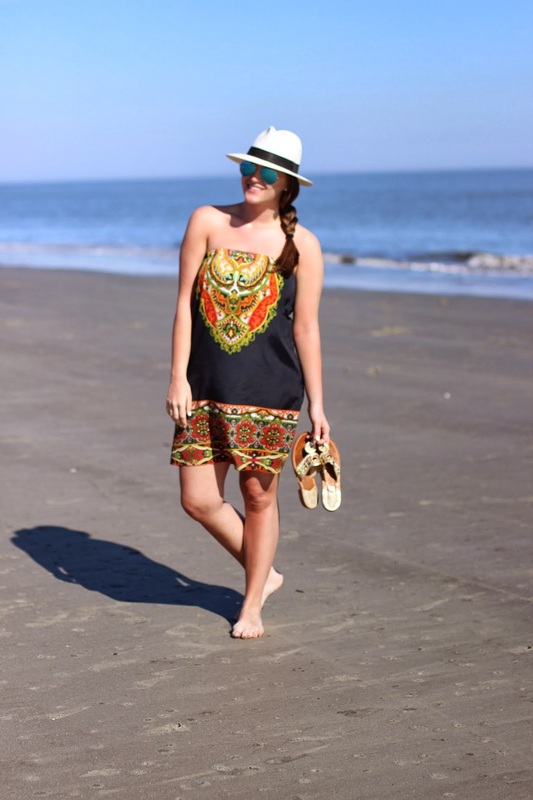 This look was one from our second day-- just a simple beach outfit. We spent the day in the sand and around the water (very cold water). Besides getting a major sunburn, it was totally worth it. I bought this dress 3 years ago (it's served me well) and I wear it really when I don't want to wear clothes (go figure). It's great for a really hot day or anytime near water. The material doesn't show any wetness, while also being really flowy and easy for harsher weather. Plus the print is hard to beat. $40 well spent if you ask me! As for the hat and sunglasses, they were my go to accessories for traveling, playing around and hanging on the beach. Theses Ray-Bans are obviously the best for pictures, but they're also pretty great for creeping blocking out the sun too. The hat of course was great for the dirty/windy/salty hair all day long AND great for the harsh sun. Not the easiest to travel with, but that's why you just wear it for the trip! Going to the beach I had to also break out my Jack Rogers. I miss these bad boys and I was pumped to finally wear them (although, my feet weren't ready just yet). The print on that dress is amazing- definitely $40 well spent! Makes me long for beach days & summer! It sounds like a great beach dress. I'm always on the lookout for good coverups. I LOVE the first picture you posted! This is such a great beach outfit. I am especially loving those Jacks & I completely agree about missing them this winter!